I found lot of posts about Oracle Database 18 XE. It's very interesting for me. I didn't blog about how to install, because it's very easy for using rpm package and document very helpful. I was interested in Enterprise Manager Database Express 18.4.0.0.0. How it looks like? - Installing. I used CentOS7. - As I didn't want to connect 127.0.0.1, I changed binding - "Making Oracle Database EM Express Available to Remote Clients"
However, I got some error like "Connection with database failed. 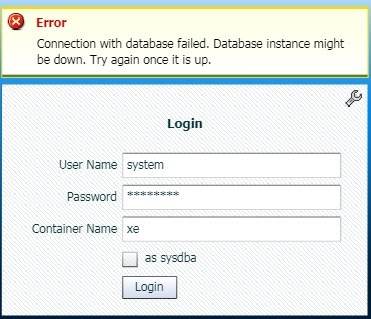 Database instance might be down." - Checked alert log file and fixed. Error: Global ports off in Root, do SetGlobalPortEnabled(TRUE) to enable. Global ports off in Root, do SetGlobalPortEnabled(TRUE) to enable. Setting the Global Port for EM Express to Manage a CDB and the PDBs. (It might not be the right solution, but I just wanted to see EM). It worked fine for now.